Last summer, Sue and I watched The Way, starring Martin Sheen. The film follows Sheen's character on his nearly 500-mile pilgrimage across Spain to Santiago. His backpacking odyssey was meant to honor his son (played by his real-life son Emilio Estevez), who had died in the Pyrenees Mountains on his solo trip on the ancient path. The journey is an awakening for Sheen's character in many ways. “Great film,” I said afterward. “We should do it,” Sue replied. She must be joking, I thought. Nearly a year later, we are about to begin our journey. Pilgrims have walked The Way of St. James since before medieval times, dating to the 8th Century. Their walk began at their home and ended at the shrine to St. James in Santiago de Compostela, where it is believed St. James' remains are buried. The most well-known path begins in St. Jean, France (point A on the map), travels over the Pyrenees and across Spain to Santiago de Compostela. It passes through villages and cities with rich histories of offering pilgrims lodging, food, medical help, and much more. 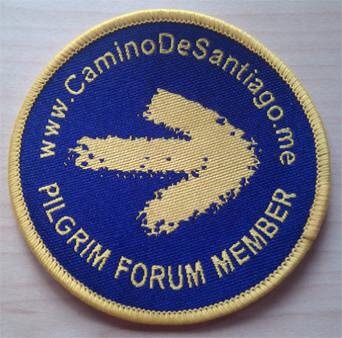 Today's pilgrims carry a special passport that grants admission to the many hostels (albergues), which offer a bunk, hot shower, camaraderie, a place to cook, and often a pilgrim meal with Spanish wine. Partly sparked by Sheen's film, the number of pilgrims has exploded recently, with more than 192,000 traveling one of the paths in 2012. About half were Spaniards and 7,071 were Americans. About 56 percent were male and 164,778 traveled on foot. More than 27,000 bicycled the Camino, an offense to some traditionalists. At least one reportedly rode a unicycle. More than 22,000 started in St. Jean (point A), where Sue and I plan to begin. About 40,000 completed just the minimum required for a certificate of completion, 100 kilometers, or about 62 miles. Some began walking from afar. Thirty-one started their pilgrimage in Rome, three in Jerusalem. More than 56 percent were aged 30-60, 28 percent were younger than 30, and nearly 15 percent were older than 60. I am 60 and Sue is 56. We should feel right at home, age wise. I know the Camino will provide unique opportunities and challenges. Thank you, Martin Sheen. And Sue! Good luck you two! Too bad you couldn’t have ended in Bize when we were there, but we look forward to your stories. Thank you, Cynthia! Perhaps we can coordinate better next time. I will be thinking of you both as you start on the Camino de Santiago-I know this will be the most amazing adventure and life experience for you two pilgrims. So excited for you-cannot wait to see the posts! I shared your plan with my family at our Easter dinner tonight-Mom, Joan, and Lorie all wish you a safe and rewarding journey! Thanks so much, Dennis and Carolyn. Let’s hope it is like the golf course, where it never rains! We appreciate the encouraging words, Carole and Beaton! We may have to start on the Spanish side of the Pyrenees. It has been snowing for awhile there and there is little prospect for improvement. Ah, well, it will give us a couple more rest days during the journey. I hope you have an absolutely fantastic journey. I’ll look forward to reading all about it — and hopefully hearing all about it in person after you return! We are looking forward to joining you on your journey, through your posts. Be careful, Enjoy this amazing adventure!! Many thanks, Greg and Cathy…we look forward to getting together when we return! I hope you two packed some excellent shoes!! Our shoes are made for walking, Brad!